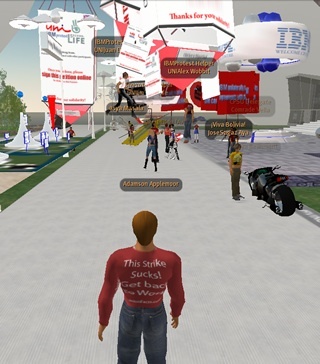 Carrying virtual placards reading “workers of the world unite” and demanding more or larger bonuses, IBM employees in Italy have launched a “virtual strike” in the virtual world known as Second Life. 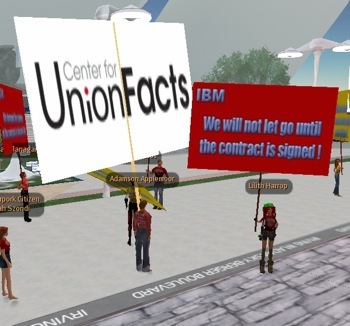 We decided to check out the “strike” at IBM’s Second Life headquarters and give the picketers a little dose of UnionFacts.com. So we sent in our own virtual counter-protester — complete with slogan and sign. All in all, we must report being disappointed in the verve of the virtual strikers. Most just stood around shouting typing platitudes. No word yet on what constitutes “strike benefits” in a world where virtual deviance is virtually everywhere. UPDATE: It is just another day on the virtual picket line for CUF, but now we’ve got a big, honkin’ sign. That’ll show ’em.